Throughout its history Moody has held to the essentials of biblical orthodoxy. In addition, it has defined itself in other distinct ways in terms of more specific interpretations of Scripture. These positions are reflected in the Doctrinal Statement (1928) documents and policies published by Moody. These Institutional Positions Related to the Moody Bible Institute Doctrinal Statement (1928) were produced to clarify and make explicit the doctrinal positions of the institution. While Moody’s particular definitions are important to its position, it is readily recognized that they do not define orthodoxy for the whole body of Christ. Moody gladly embraces all who faithfully adhere to the essentials of biblical Christianity as fellow believers and colleagues in Christ's cause. Whereas biblical Christianity is defined by the central tenets of the faith, throughout the history of the church various groups have employed more specific definitions to define themselves. Historically Moody has maintained positions that have identified it as non-charismatic, dispensational and generally Calvinistic. To maintain continuity and consistency with the heritage entrusted to its care, Moody expects faculty and administration to agree with, personally adhere to and support Moody's doctrinal distinctives as noted above and defined in the following Institutional Positions Related to the Moody Bible Institute Doctrinal Statement (1928). Jesus Christ is the image of the invisible God, which is to say, He is Himself very God; He took upon Himself our nature, being conceived by the Holy Spirit and born of the Virgin Mary;2 He died upon the cross as a substitutionary sacrifice for the sin of the world;3 He arose from the dead in the body in which He was crucified; He ascended into heaven in that body glorified, where He is now our interceding High Priest; He will come again personally and visibly to set up His Kingdom4 and to judge the quick and the dead. 2 Jesus Christ, the only begotten Son of God, is fully God and fully man possessing both deity and humanity united in one person, without division of the person or confusion of the two natures. 3 An individual receives the benefit of Christ's substitutionary death by faith as the result of responding to the message of the gospel. Salvation is the free gift of God's grace through faith alone, in Christ alone, therefore not dependent upon church membership, intermediaries, sacraments or works of righteousness to attain or sustain it. 4 It is Moody’s position that this refers to the premillennial return of Christ at which time He will set up His millennial reign, during which time He will fulfill His promises to Israel. 5 This affirms that the first human beings were a special and unique creation by God as contrasted to being derived from any pre-existing life forms. Further, God created everything "after its kind," which excludes any position that allows for any evolutionary process between kinds. 6 This statement excludes any position which asserts a temporary or complete cessation of consciousness or merging with eternal oneness or annihilation of the damned or a "second chance" or a period of suffering or purification in preparation for entrance into the presence of God. 7 The Church of Jesus Christ is a distinct entity from Israel in the ongoing program of God. Further, this universal Church consists of all who possess saving faith in the death and resurrection of Jesus Christ from Pentecost to the Rapture of the Church and which will represent every language, people and nation. 8 Christ will return in the air preceding the seven-year Tribulation at which time He will receive into heaven all believers who constitute His church. During that tribulation period, God will bring salvation to Israel and the nations while exercising judgment on unbelievers. 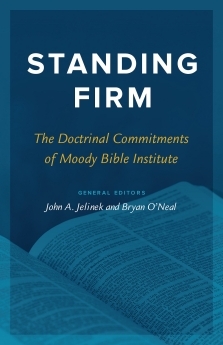 Dig deeper with Standing Firm, a resource written by Moody professors that breaks down and expands on 11 theological topics from Moody's doctrinal statement.